Newest features in the bottom of page. You may click on some pages to get read sizes. 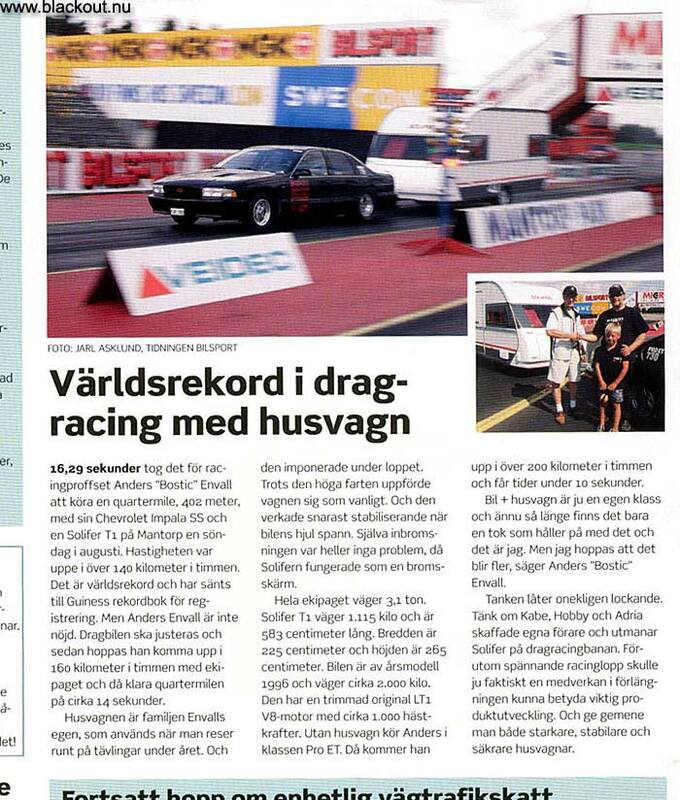 of the shorter articles...but maybe a mistake or two will follow...? 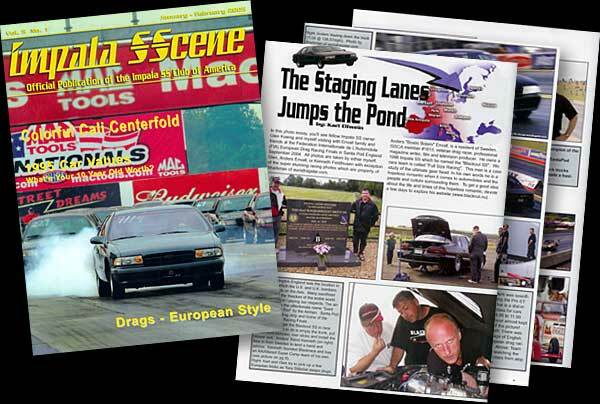 drag race on Pite Dragway in 1982 and it was published in All Mighty Hot Rod Magazine in May 1983! 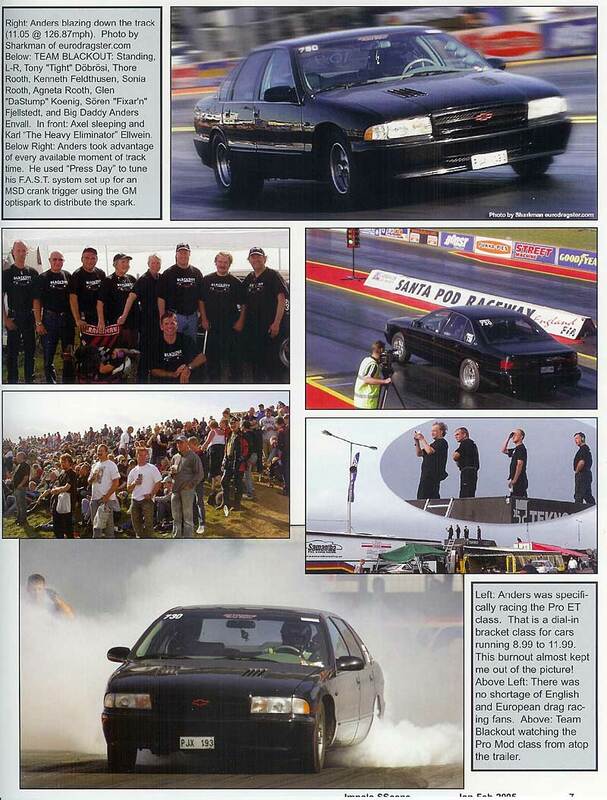 The return of Bostic to Dragracing after 15 years "out in the cold" became a jamboree. The Swedish Government sent flowers and a horse. 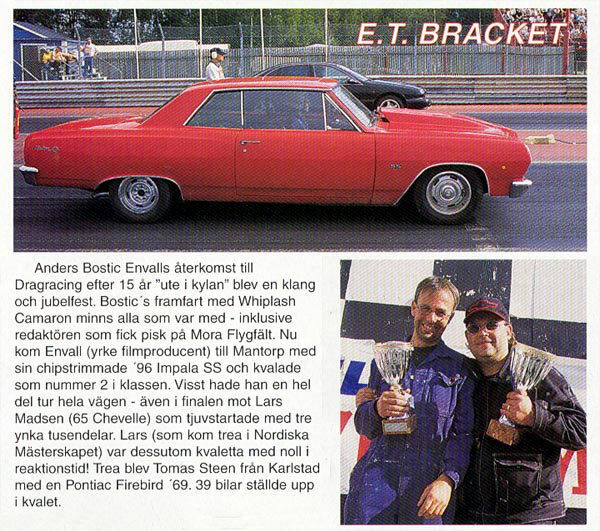 Steen from Karlstad with a '69 Pontiac Firebird. 39 cars entered the qualifying. 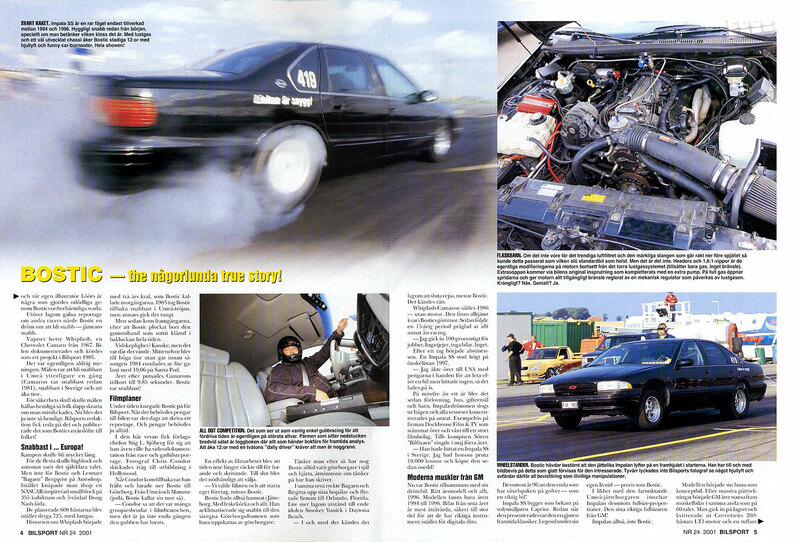 Click pages for bigger versions. 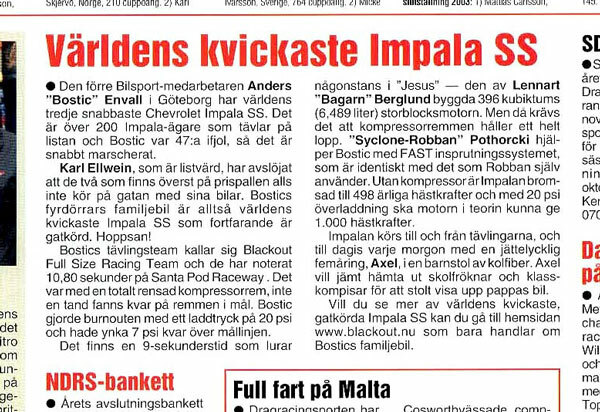 "Sort Guld" - Black Gold. Click on each page to read one by one. 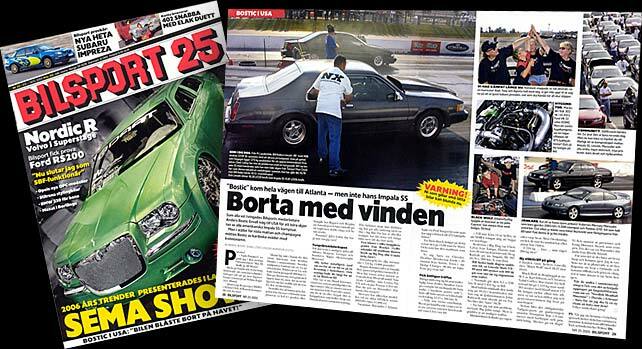 from Gothenburg has the world's third fastest Impala SS. the street. 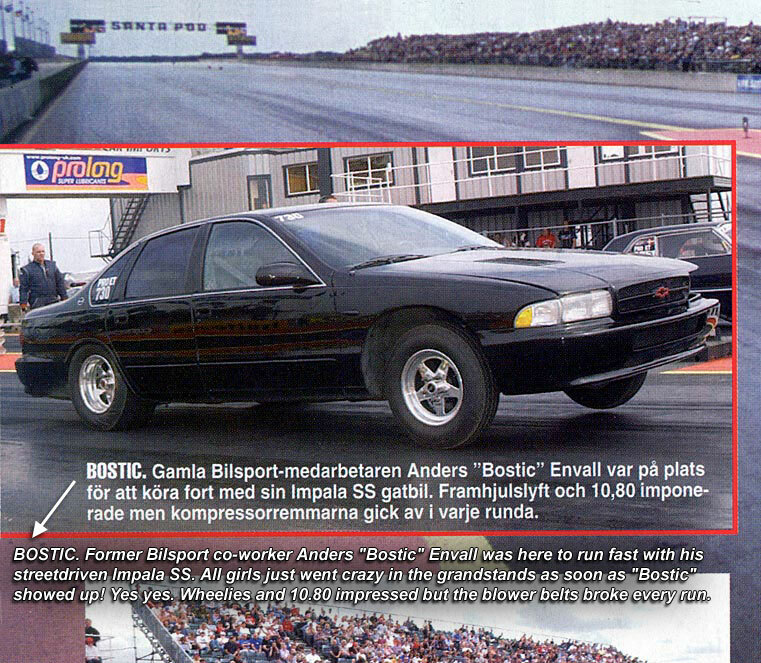 So Bostic's 4-doors family car is the world's quickest Impala SS still on the street. 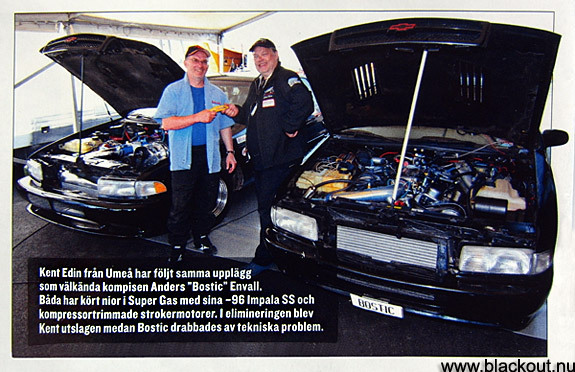 built by Lennart "Bagar'n" Bergqvist. But then the belt must last all the way. 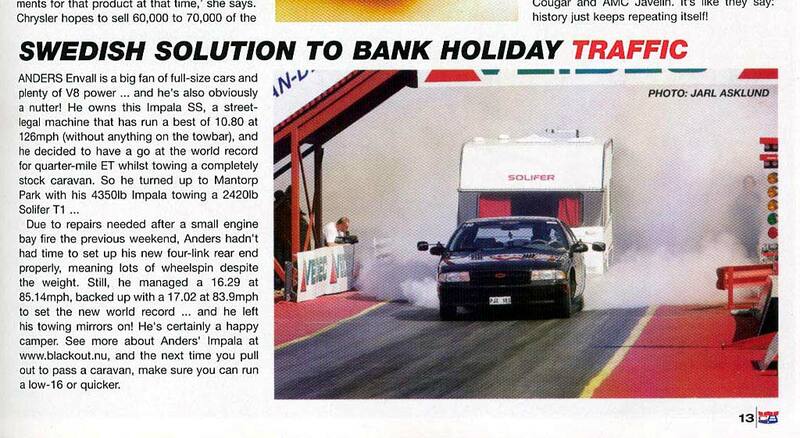 1000 hp at a maximum of boost. and the other children to come outside so that he can proudly show off daddy's car. 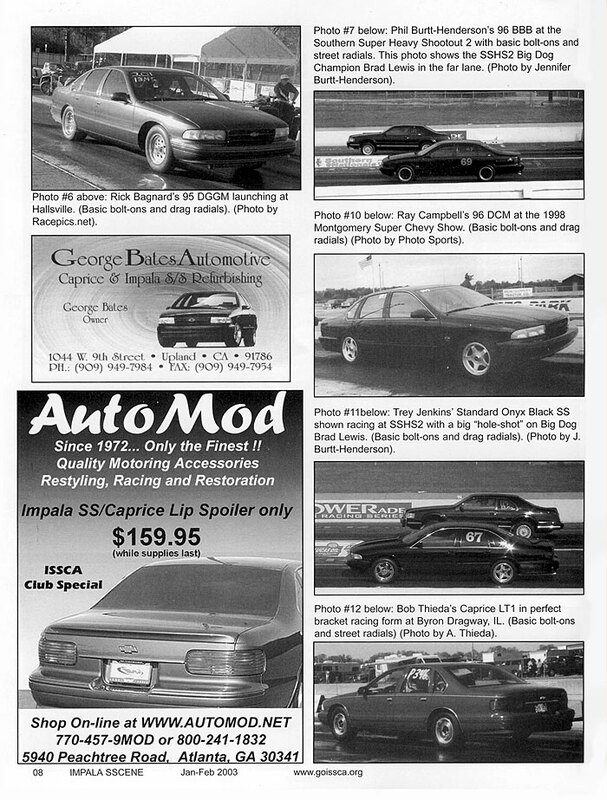 If you want to see more visit www.blackout.nu which is only about Bostic's family car. 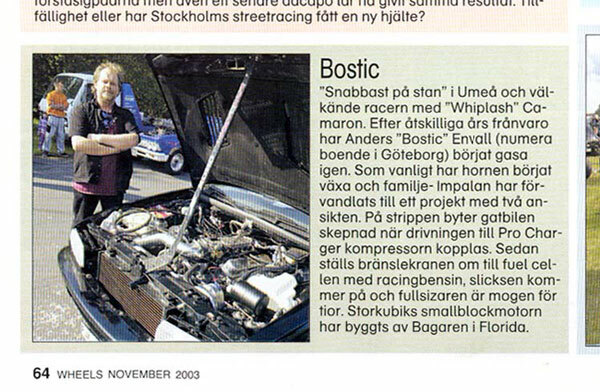 Bostic - "Fastest in town" in Umeå and the well known racer with the "Whiplash" Camaro. cell containing race fuel, the slicks come on and the fullsize is ready for 10's. 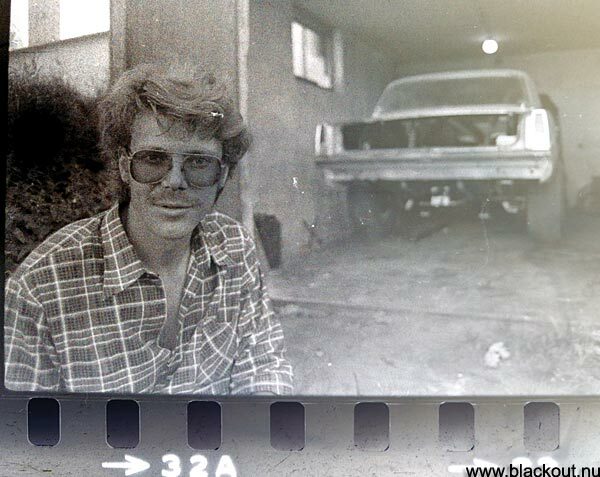 The big cubic smallblock is built by "Bagar'n" in Florida. Hey, it's all in English! 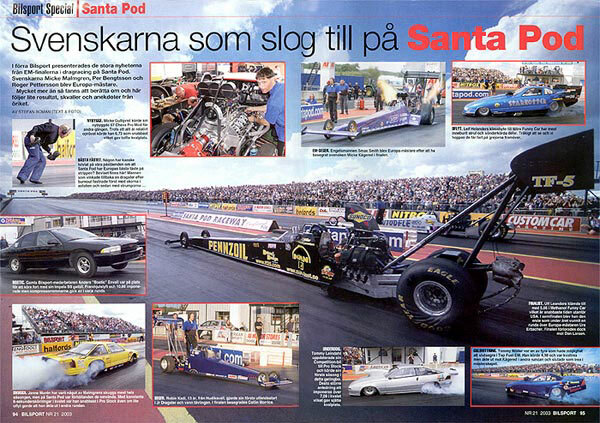 Feldthusen, Rick McCann and Carla Pittau and more. 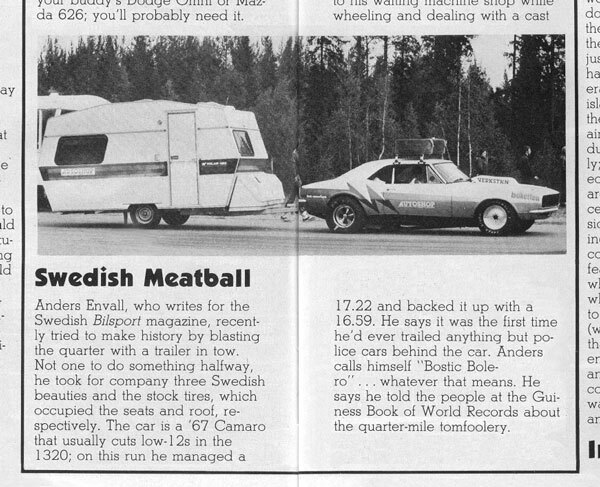 foreigners and Swedes alike. Click it to make a try! 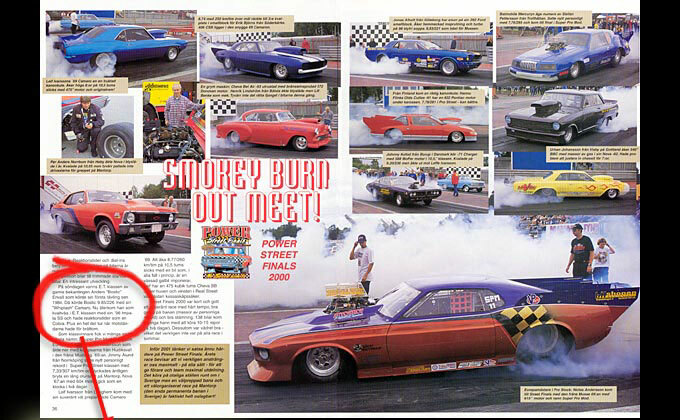 also has a good biography on Smokey Yunick! 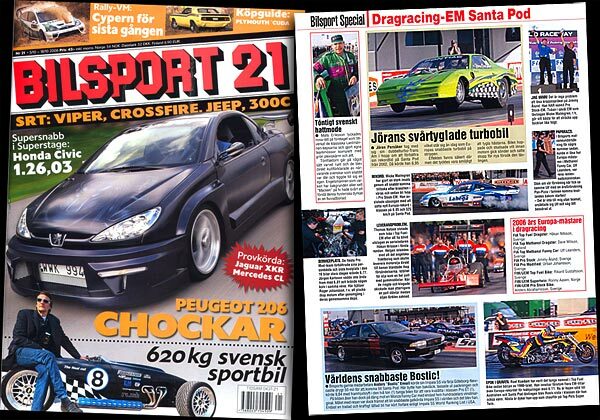 With pictures as well! Get it! recognized the record runs. Click on article to get a biggie. 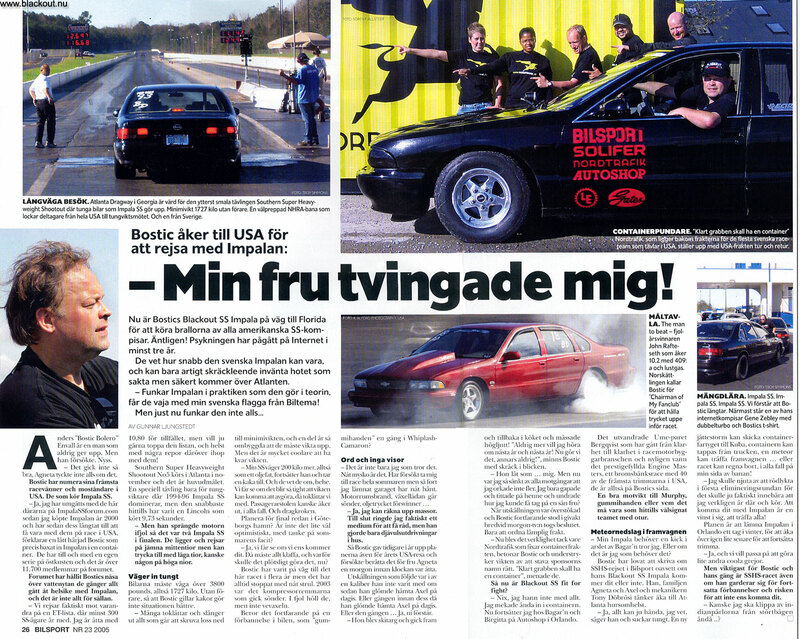 Headline: "Bostic goes to USA to race his Impala - My wife forced me!" 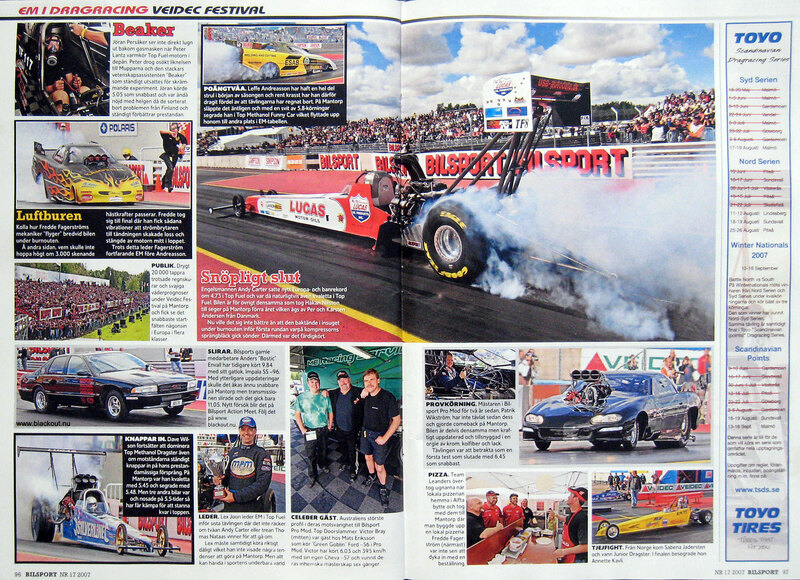 Click it to get a large readable version! exposed nationwide in Bilsport Magazine! 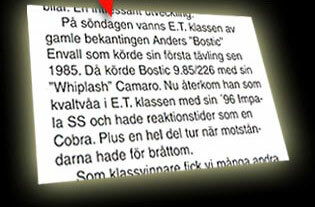 Headline: "Gone With the Wind"
...and of course something had to go wrong! The hurricane Wilma stopped the containership with our Impala and went to Panama! 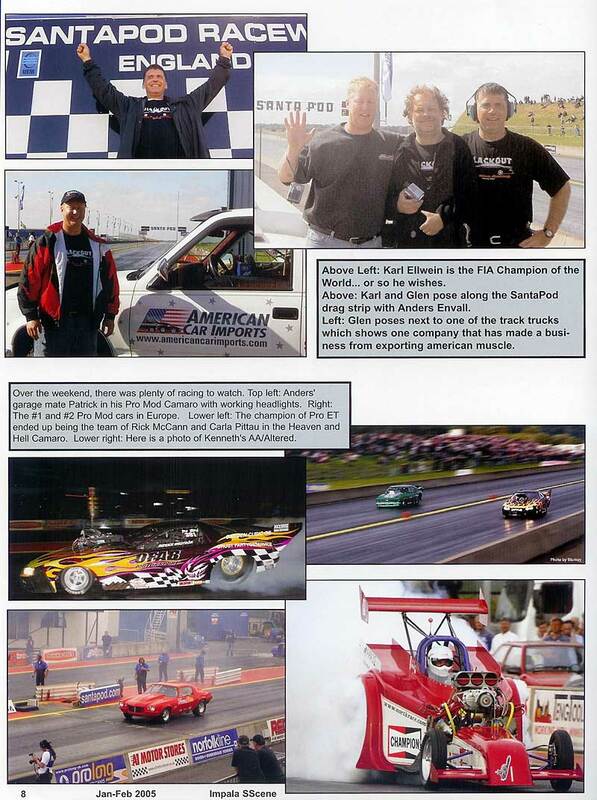 We got to the race in Atlanta without our car but had a great time. Also read more about it here. different trailers but the same maniac. 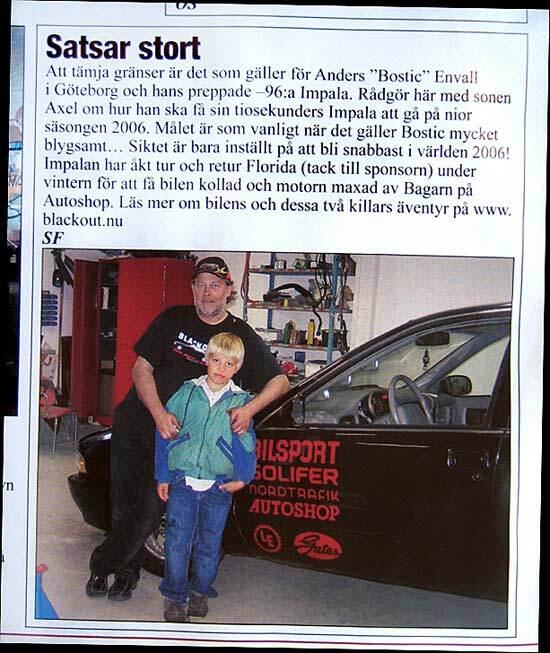 Autoshop. 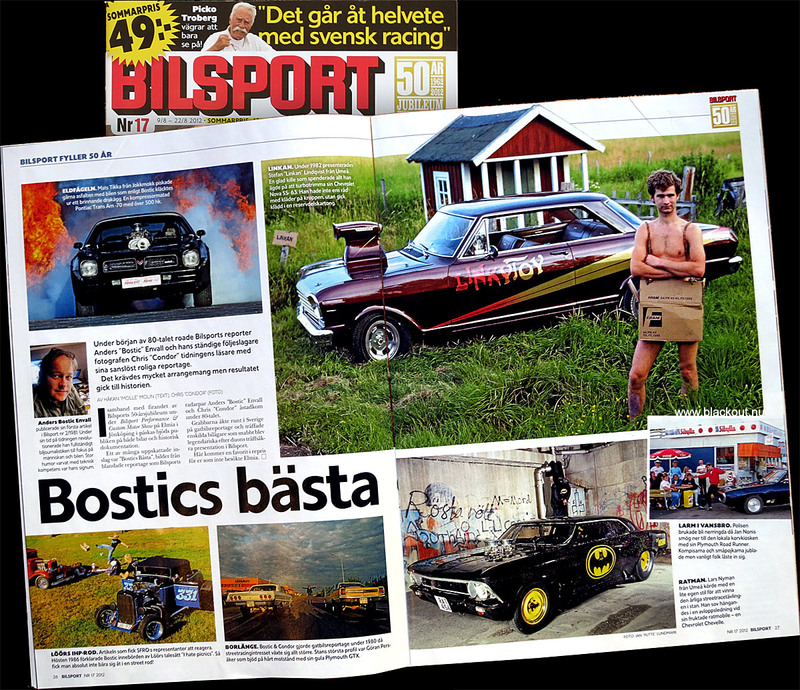 Read more about the adventure of these two guys at www.blackout.nu"
Thank you Sören "Fixar'n" Fjällstedt and Wheels magazine for the attention! was the bonus, which at least we made happen! We're very happy for that! 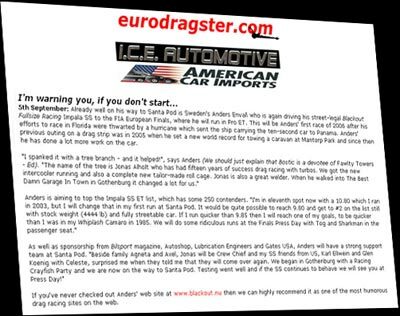 Laser sharp predictions - for once =) ..Click it to read! 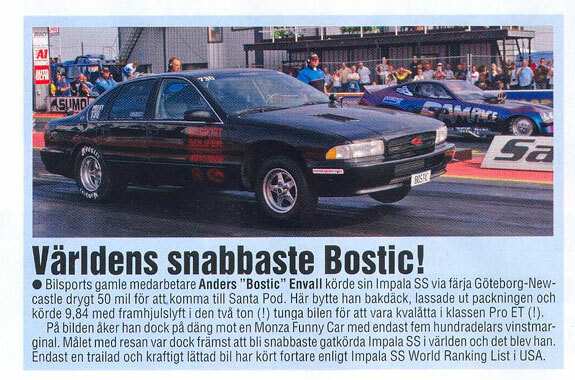 Note headline: "World's Fastest Bostic!" to be 8th Qualifier in Pro ET(!). 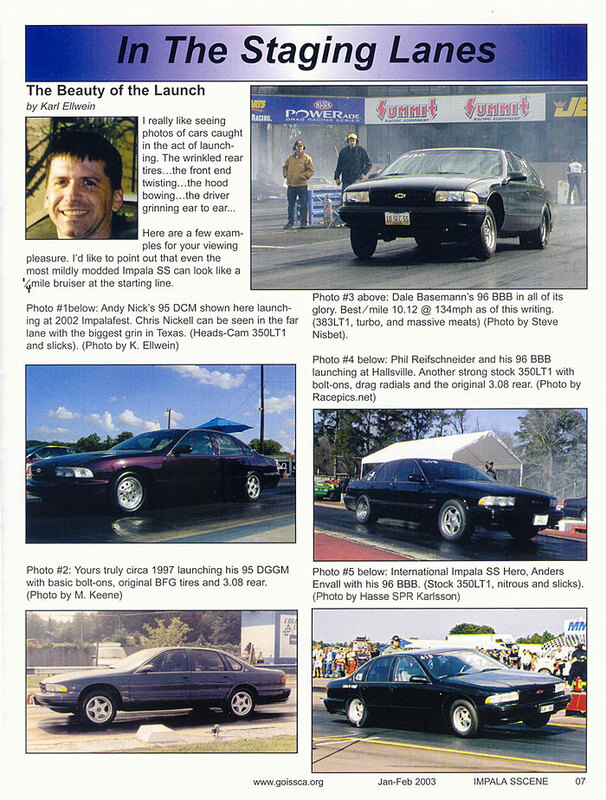 car have been faster according to the Impala SS World Ranking List in USA. 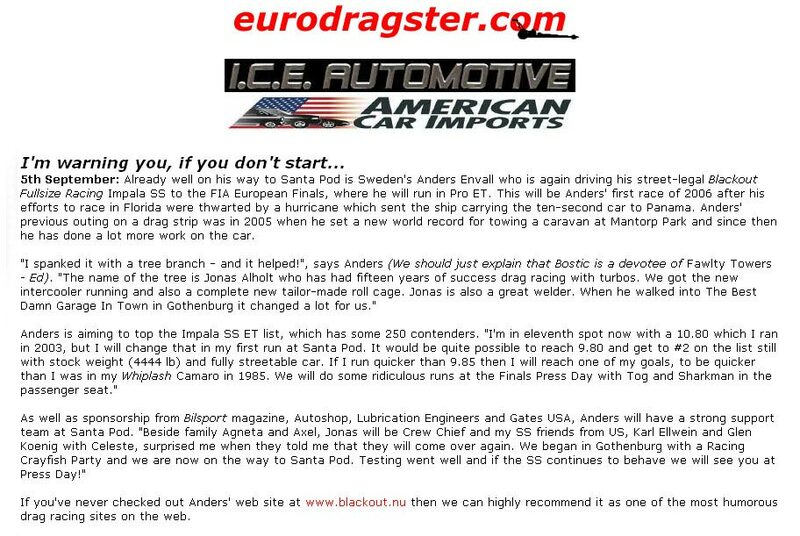 Read my report from this race here! from every race, every day! We were of course especially glad to see that 2/3rd of all projects in TBDGIT was noted! 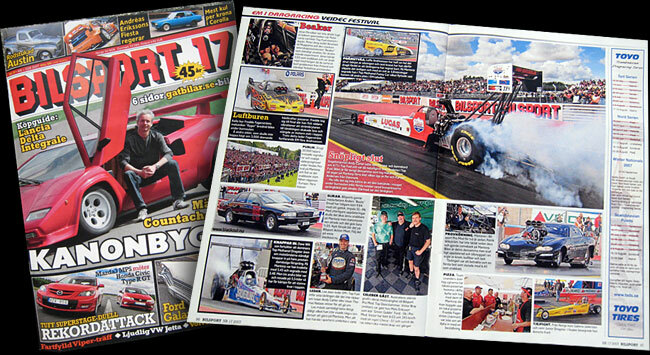 Both Patrik's new premiere in Pro Mod and even my troublesome appearance in Super Gas! 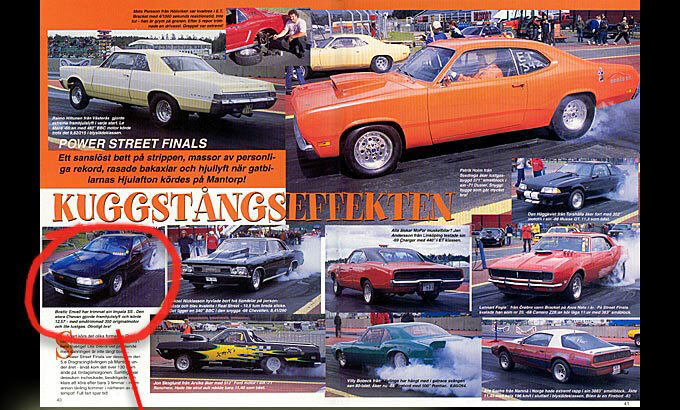 If you click above magazine you'll get to read the whole spread - in Swedish! 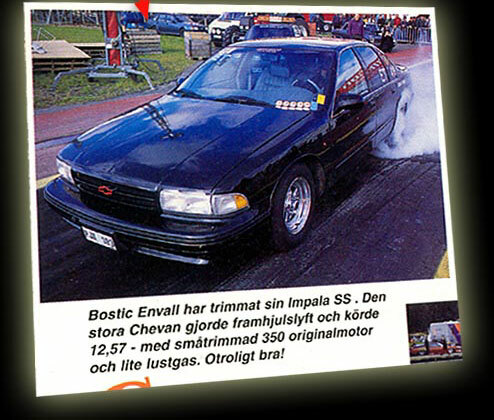 "Bostic" Envall has gone 9.84 earlier in his Impala SS 1996 locomotive. 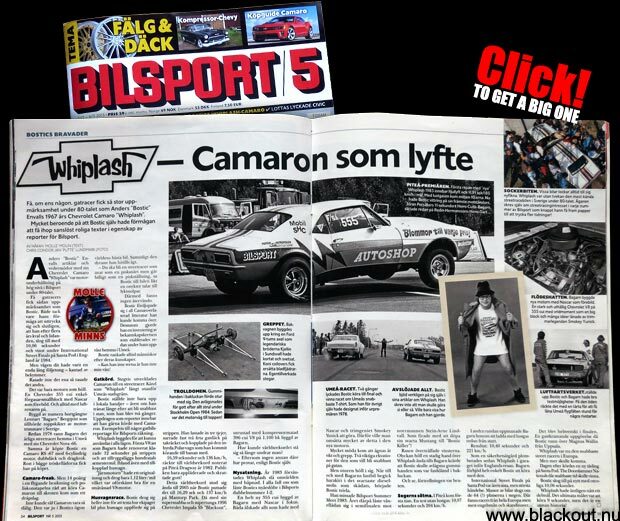 New try at Bilsport Action Meet. Follow it at www.blackout.nu"
fiber and paint. 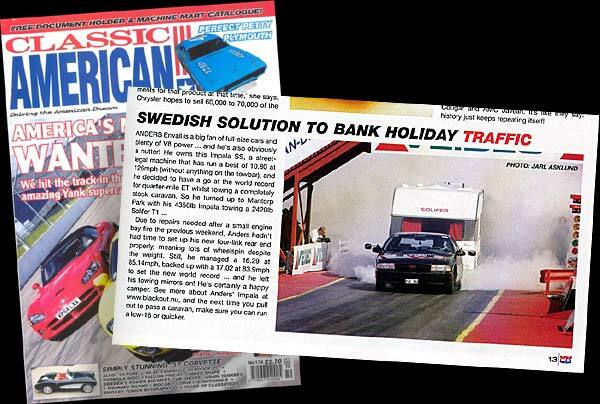 The race was considered a first test which ended with a 6.45"
buzzing of Sweden Internationals - the largest drag race in the Nordic countries. was hit with technical problems. 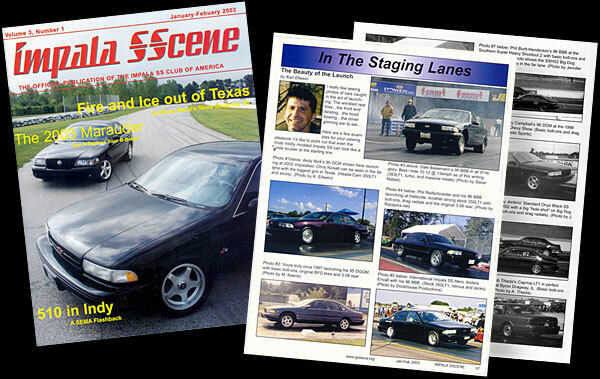 (Editor's note: So far Blackout SS haven't gone 9's in Super Gas). 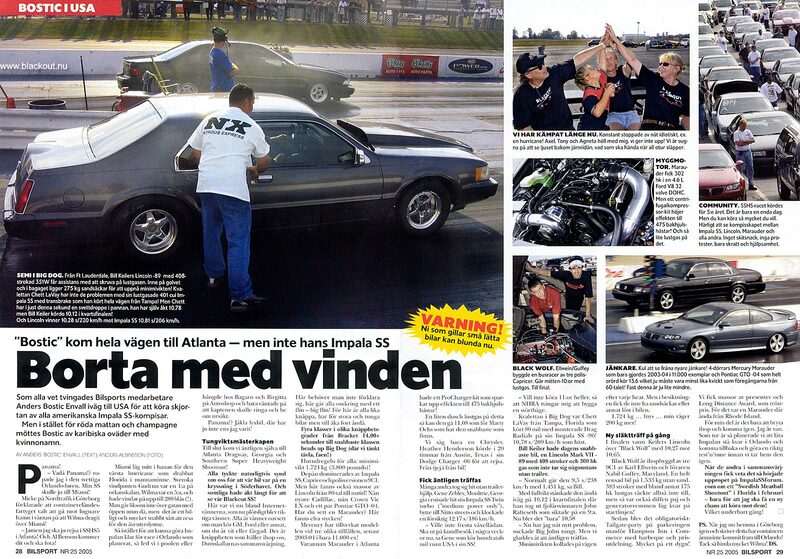 with his street driven Impala and he was very surprised that he wasn't qualified 1st! which unfortunately stopped the rampagings". 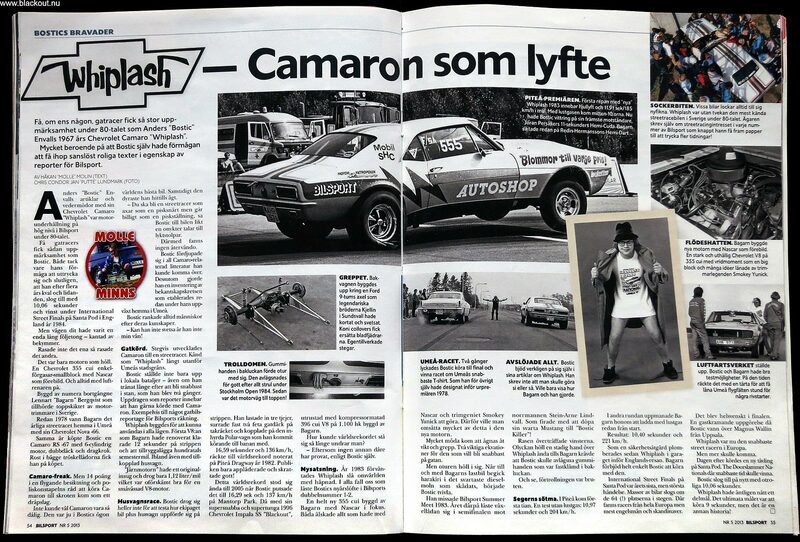 "The Legends That Created The History"
chapter in Christina Bodéns newest book on Swedish drag racing! 332 pages and 13 chapters of REAL good history! Fun and interesting! 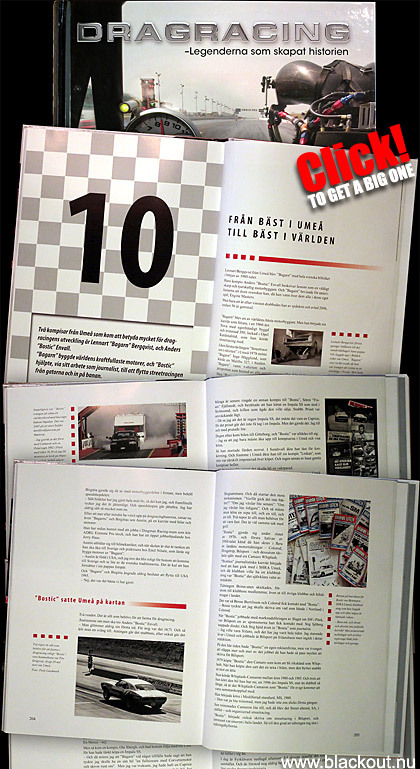 Our chapter is # 10 "From Best in Umeå to Best in the World"
last chapter on how Tierp Arena was built! 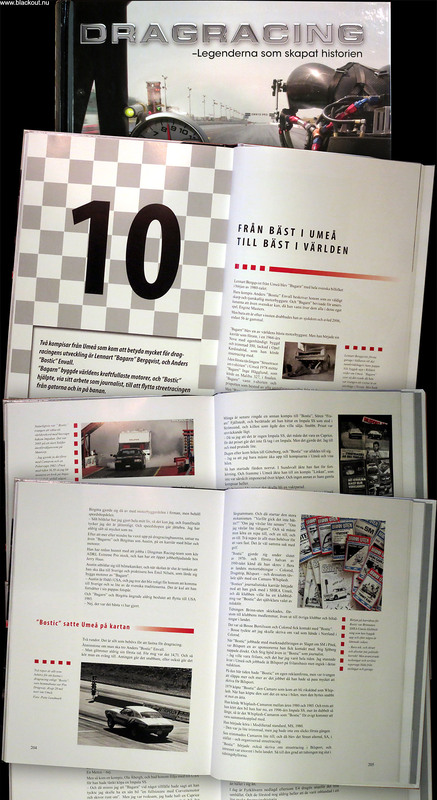 The book was released on Tierp Arena during the Scandinavian Internationals. the book because you want to read all the pages about all the people! 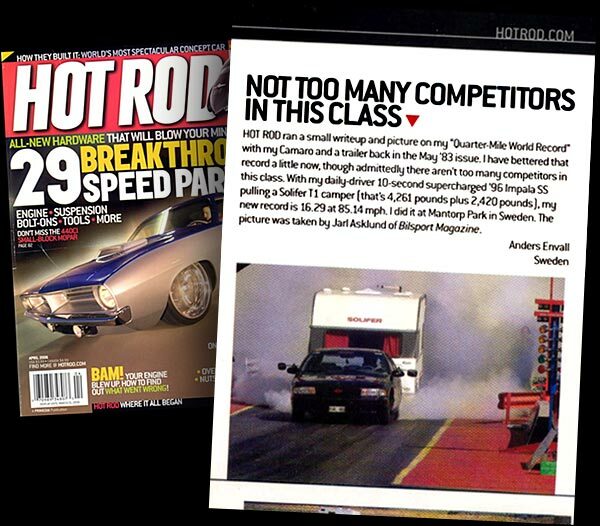 the 1966 Nova streetracer he had. 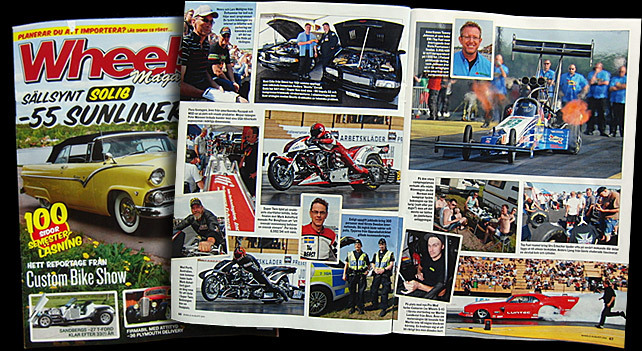 It was the rules of drag racing and he wanted a timeslip badly! 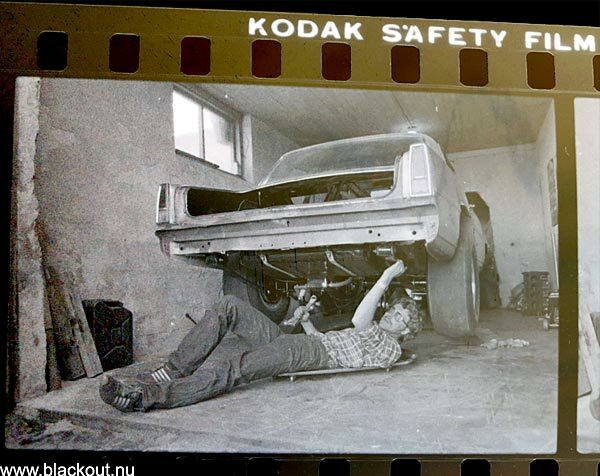 But he only found thick wall pipes in Umeå so he had to put on some serious weight in the car! Here's a picture only for you. I wish "Bagarn" had lived to read it! 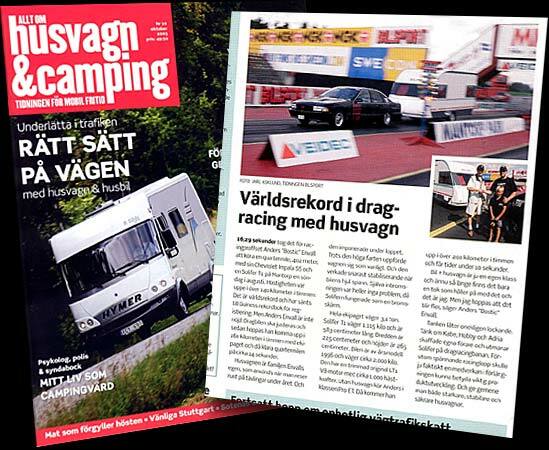 Birgitta loves it and says "Bagarn"
and for all the work you have done with it!